In a home plumbing emergency, you can count on us. With one simple phone call, you can limit the stress and property damage that a sudden plumbing problem can bring. Our courteous, knowledgeable technicians will restore your household plumbing to proper function as soon as possible so you can carry on with your busy day or enjoy a restful evening. Call M.A.C. Stewart for emergency plumbing repair. When you have a commercial plumbing emergency, we get your business back on track--in a hurry. Your customers and employees won’t be delayed or inconvenienced for long once your experienced Plumbing professional arrives on site. We also offers non-emergency plumbing maintenance services to keep your household or commercial plumbing system in top shape. Regularly scheduled maintenance helps eliminate those nasty surprises that interrupt your life, throw a wrench into your productivity and bust your budget. When you need a routine repair, new installation or a system upgrade, M.A.C. Stewart Plumbing handles your project efficiently and flawlessly. When you need an experienced plumber in a hurry, call on us . We’re in the neighborhood, available 24/7/365 and we never charge for overtime. What are 3 things you can do during a burst pipe emergency before your plumber arrives? Shut off the water valves: This is first and foremost. If you are having trouble doing this on your own we will walk you through the steps right over the phone. Valves are generally located around sinks and toilets, but for the most effective temporary solution, you want to locate the main valve. Once the main is turned off, the water will stop flooding in. Perform a quick fix: While you are waiting for us, put a container under the burst pipe and use tape to seal off the hole as best as you can. These steps will help prevent further water damage until we can get there and fix the problem. Contact your landlord: When the pipes burst, after getting in touch with us, you should put a call in to your landlord and let them know what’s going on. They may be able to locate the main valve or provide other assistance before we arrive. How can you prevent clogged toilet emergencies? To prevent this troublesome problem, be careful with what gets flushed down your toilet. Avoid things like sanitary napkins and other feminine products, paper towels, and even too much toilet paper. We can check your pipes to make sure they’re clear of build up so you won’t face this situation. 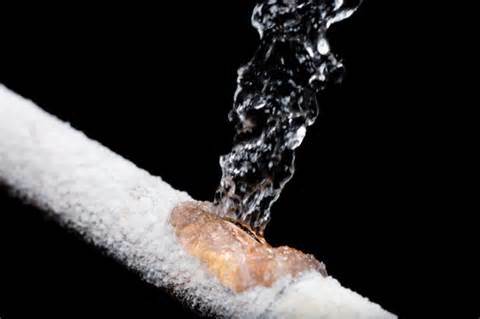 Leaking water: If a pipe is leaking, shut off its water supply. Follow up by locating the main valve and shutting that off as well. Clogged toilets: For toilet clogs, shut off the water supply to the toilet and use a mop to soak up as much of the spillage as possible. This will prevent damage from the water seeping into floor tiles. Garbage disposal issues: If it’s an emergency involving your garbage disposal, shut off the water and the power to the disposal until we arrive and fix the issue. Use a five gallon bucket as a tool holder. And if a leak springs mid-project, it'll catch the water. A tool caddy can also be attached to the bucket providing a place for everything. Wrenches are essential in plumbing. A pair of medium sized slip joint pliers and an adjustable wrench should cover most jobs, along with various sized wrenches. A multi-bit screwdriver can reduce the number of tools that need to be carried around on the job. An assortment of Allen keys is very handy and has many uses. Duct tape and leak sealing tape can help out in a plumbing emergency until a permanent fix can be made. Teflon tape will seal up leaks from around threaded connections. A variety of blind caps can help you see your way through repairing a broken valve. Heavy duty paper towels or rags will help clean up water from small leaks.